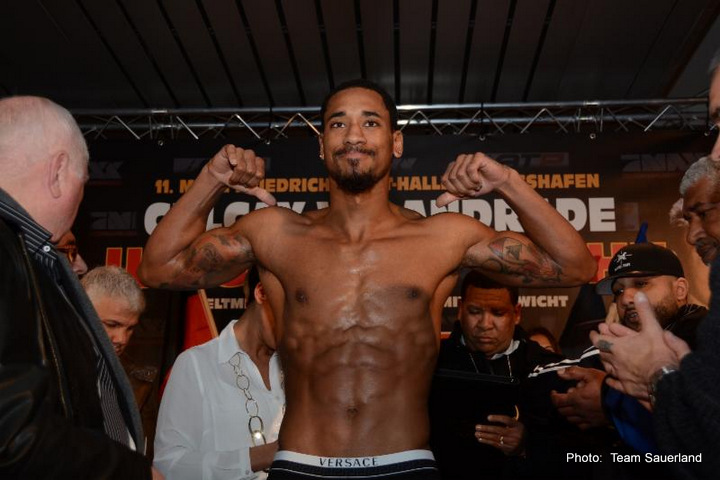 Undefeated Demetrius “Boo Boo” Andrade knocked down Walter Kautondokwa four times en route to a twelve-round unanimous decision (120-104, 120-104, and 119-105). With the dominating victory, he captured the vacant WBO world middleweight title that was stripped from Billy Joe Saunders, who tested positive for a banned substance (Oxilofrine) and was denied a license to fight by the Massachusetts State Athletic Commission. Andrade is now a two-division world champion. Andrade dropped Kautondokwa with a short left hook in the first-round, although the knockdown was more from Kautondokwa tripping on Andrade’s feet than from a punch. Andrade should have also been deducted a point for throwing an illegal punch at Kautondokwa as he was headed towards the canvas, but referee Steve Mills did not see it. Andrade scored another knockdown in the second and two more in the fourth-round, all from left hooks. After Andrade knocked down Kautondokwa for the third time, his glove touched the canvas which should have been ruled a rare double knockdown, but again, referee Mills did not see it. After the fourth, Andrade cruised for the next eight-rounds. He pressed the action and landed whatever he wanted, but he never really tried to end the fight. He seemed too content to continue to box and display his great defense. He also did not let his hands go as much as he should considering that Kautondokwa never landed anything of significance in this fight. After the bout, Andrade told reporters that he had problems with his left shoulder leading up to the fight and that he re-injured it in the fifth-round. According to CompuBox punch statistics, Andrade landed more punches than Kautondokwa (152 to 45), threw more (501 to 325), and had a better connect percentage (30 to 14). Kautondokwa never landed more than eight punches in a round. Now that Andrade has the world title, he will have plenty of attractive options as to who he will fight next and maybe, he will finally get the significant bout that he has been looking for his entire career, which could be against Saunders, Canelo Alvarez, or Gennady Golovkin. This eleven-bout fight card was promoted by Matchroom Boxing, in association with Murphy’s Boxing and DiBella Entertainment. It was televised by DANZ from the TD Garden in Boston, Massachusetts. IBF and WBA female lightweight world champion, Katie Taylor scored a dominating, one-sided ten-round unanimous decision over Cindy “Checkmate” Serrano, as she prevailed on all three scorecards (100-90). She retained her world titles for the fourth time. The 2012 Olympic gold medalist and heavily decorated amateur standout, landed whatever she wanted as she pummeled Serrano throughout their lightweight bout. Taylor also connected on the vast majority of the power shots, many of which staggered Serrano. Serrano demonstrated a great deal of heart by somehow making it to the final bell, despite Taylor aggressively going for the knockout in the last couple of rounds. Taylor, who is considered one of the top ten pound-for-pound female boxers in the world, kept her undefeated record intact (11-0, 5 KOs). Serrano fell to 27-6-3, 10 KOs. She lost for the first time since 2012. IBF lightweight world champion, Tevin “American Idol” Farmer punished James “The Assassin” Tennyson and then dropped him for the second time from a left hook to the body which prompted referee, Arthur Mercante Jr. to quickly waive off the fight at one minute and forty-four seconds in the fifth-round. Farmer improved to 27-4-1, 6 KOs and made his first successful defense of his world title that he claimed via a twelve-round unanimous decision over Bill Did in August. He also scored his first knockout in three years. He has won twenty in a row since his last loss in 2012. Tennyson dropped to 22-3, 18 KOs. He had his six-bout winning streak stopped. Farmer buckled Tennyson knees several times in the fifth before he landed a crushing right hook to the body. He also dropped Tennyson with the same punch in the fourth-round. Farmer controlled the fight as he was too fast and too strong for Tennyson. Farmer might fight on the undercard of the Canelo Alvarez vs. Rocky Fielding fight on December 15th. Kid Galahad defeated Toka “T Nice” Kahn Clary via a twelve-round unanimous decision (118-100, 118-100, and 115-113), however, this bout was a great deal closer than the scorecards indicated and the two 118-110 scorecards were way off. Since Galahad prevailed in this IBF featherweight title eliminator, he will face off against the winner of the Josh Warrington vs. Carl Frampton match up which will take place on December 22nd. Both fighters displayed great jabs and excellent defense, although it appeared to this writer and many ringside reporters that Kahn Clary pressed the action and landed the better combinations. He also seemed to connect on the much harder punches, including several hard uppercuts, although the judges did not see it that way. Galahad kept his undefeated record intact as he improved to 25-0, 15 KOs. Kahn Clary dropped to 25-2, 17 KOs. He had his six-bout winning streak stopped. Tommy “Boom Boom” Coyle defeated Ryan “Polish Prince” Kielczweski via a ten-round unanimous decision (99-90, 98-91, and 96-93). Kielczweski fought hard, however, he was out work and out landed throughout this junior welterweight bout, especially in the second half of the fight. Coyle also connected on the much harder shots. He knocked down Kielczweski in the seventh-round via a series of hard body shots. Kielczweski was slow to get up, but not only did he somehow survived the round, but he went punch-for-punch with Coyle in a great exchange in the last thirty-seconds of the round. Both fighters went after one other for the next three-rounds, but Coyle continued to land the better, harder combinations. Coyle upped his record to 25-4, 12 KOs. He has won three in a row. Kielczweski, who was a late substitute for Danny O’ Connor and moved up in weight, fell to 29-4, 11 KOs. He had his three-bout winning streak stopped. Kielczweski will be back in the ring on November 21st. Former two-time world champion, Scott Quigg made quick work of Mario “Maca” Briones with a second-round technical knockout victory. Quigg improved to 35-2-2, 26 KOs. Briones dropped to 29-8-1, 22 KOs. It was a good back-and-forth first-round with both boxers connecting on hard left hooks, but Quigg took over the fight in the second. He landed six unanswered powerful left, right combinations to Briones’ head as he lay defenseless on the ropes, which prompted referee, Gene Del Bianco to quickly halt the junior lightweight bout at one minute and twelve seconds. This was Quigg’s first fight since his twelve-round unanimous loss to Oscar Valdez in March of this year, in which both fighters sustained a great deal of punishment (Quigg suffered a broken nose and Valdez a broken jaw). He would like a rematch against Valdez. Mark “The Bazooka” DeLuca defeated former Contender star, Walter “2 Guns” Wright via a ten-round unanimous decision (97-93, 96-94, and 96-94) in an extremely competitive bout. DeLuca landed the more powerful punches and pressed the action, while Wright was the more active fighter, but a lot of his punches were blocked by Deluca’s good defense and his offensive output dropped a bit in the second half of the fight. With the victory, Deluca regained the IBA and NABA super welterweight titles that he lost in his last outing to Wright, who also ended his undefeated record. DeLuca upped his record to 22-1, 13 KOs. Wright fell to 17-5, 8 KOs and had three-bout winning streak stopped. Wright fought for the fourth time this year after being out of the sport for the last five-years. Daniyar “Khazak Thunder” Yeleussinov destroyed an overmatched Matt “The Mantis” Doherty as he landed several hard combinations, especially left hooks, which prompted referee, Mercante Jr. to stop the one-sided welterweight bout at two minutes and fifty-three seconds in the first-round. Yeleussinov improved to 4-0, 2 KOs. Doherty dropped to 8-6-1, 4 KOs. The 2016 Olympic gold medalist will be back in the ring on November 24th in Monte Carlo, which will be his fifth-bout of the year. Heavyweight Niall Kennedy kept his undefeated record intact as he scored a sixth-round unanimous decision victory (60-53, 60-53, and 58-55) over Brendan “Brutal” Barrett. He upped his record to 12-0-1, 7 KOs. Barrett fell to 7-1-2, 5 KOs. Kennedy scored a fifth-round knockdown from a right hook. Sean “Sugar” McComb scored a dominating third-round technical knockout win over Carlos Galindo as referee, Del Bianco stopped the junior welterweight bout at two minutes and thirteen seconds following a series of hard body shots. McComb dropped Galindo twice in the third. He improved to 3-0, 3 KOs. McComb will be back in the ring next weekend (October 27th), in what will be his fifth-bout in just three-months. Galindo dropped to 1-6. Travis Gambardella defeated Joe Farina via a fourth-round majority draw (39-37, 39-37, and 38-38) in a close, competitive, back-and-forth junior middleweight bout. Gambardella kept his undefeated record intact (5-0-2, 2 KOs). Farina suffered his first loss and dropped to 4-1, 3 KOs.